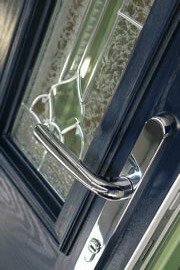 The latest UPVC Doors are highly secure, long lasting, have very low maintenance requirements, they also look pretty good. Available in many variations of colours, from Teak through to Rustic Cherry with smooth or Wood Grain effect finished surfaces. All come with multi-point locks, reinforced frames and (for units with larger glass areas) toughened safety glass. The materials used in the manufacture of this type of unit are what give composite doors their name. There are some small variations, but most front doors of this type are made of a hardwood sub-frame that contains the composite material, such as polyurethane. Typically, a composite door will be fitted within either a hardwood or UPVC steel reinforced frame. A composite front door has Glass Reinforced Plastic (GRP) outer surfaces. The average example is more than 5 times more thermally efficient than wood, including hardwood. As a result of using insulating materials, they will help to save on money on your heating bills. Long lasting – no fading, cracking or warping. 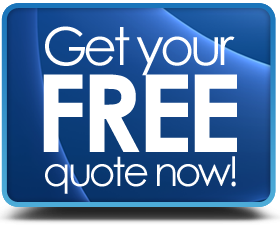 Unless you are experienced & familiar with how residential doors are measured – it is advised to have a proper survey & written quote from a certified installer. These are the sizes of the doors themselves and do not take into account the threshold or frame design. For opening that are significantly wider or higher than these dimensions, you may want to use side or top panels. For UPVC, you have the choice of over a dozen different colours. With options for either wood grain effect or smooth finish surface. Both of which are easy to clean – just rinse them down with soapy water. Glass Reinforced Plastic (GRP) outer surfaces offer exceptional resistance to wear & tear being up to 5 times less likely to dent than normal hardwood. They don’t crack, warp, twist or split and retain their looks for many years. Both UPVC & Composite front doors are probably the most secure in the market. A typical example having multi-point locks and 5 lever mortise locks fitted as standard. Many are certified “secured by design“. 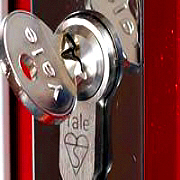 These locks are designed to defeat picking, bumping and snapping. Whist the reinforced construction of the whole entrance itself makes it very hard to force entry. In terms of front doors, most householders want to have a nice one that makes a good impression upon visitors or passers-by. UPVC front doors can be very cheap for supply only. However, you should bear in mind that at the lower end of the market you may get less quality. At the higher end of prices for front doors will be Composite versions. These are fantastic looking entrances that are very tough, energy efficient & secure. At the rear of the property, why not take a look at Patio Doors? There are 2 main differences in design to choose from such and that would be whether you want a sliding door or one that is hinged at the sides. A typical patio door would be a sliding patio door or one of the most popular alternatives would be a French patio door. The design that would give you the biggest clear space when opened would be the bifold door. The panels fold to the sides to give an amazing up to 90% clear opening. For French doors being used in a wide opening, you would probably need to fit side panels. Each standard door (of the pair) would be around 3 feet wide (overall 6ft width). Wider French doors than this cause strain on the hinges and can be awkward to handle. Front Doors Guide: Which is best, a composite or uPVC Door? If you are looking to work on a lower initial cost, then UPVC is less costly than composite. It’s possible to get UPVC for around £700+ fitted. Composite doors fitted from around £900+. Finished surfaces and visual appearance is important. Of the 2 materials, composite will give a far superior result (especially the wood-grain version). Security wise, both are about equal. Energy efficiency is also about equal. Lifespan for a composite door can be expected to last 35 years, UPVC 15yrs. So Composite is the better option here. Final Words: In our humble opinion, if you have the budget, go for composite front doors. From our point of view, they provide a better finish, look more natural and are a superior product all round.